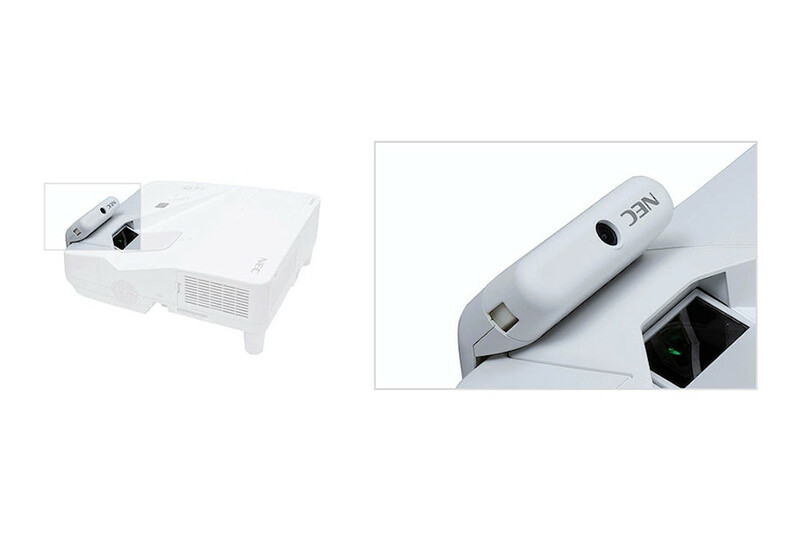 NEC’s UM361XGI is a 3600-lumen ultra short throw interactive projector that packs a multitude of features while delivering an extremely short throw distance for education and corporate applications. A complete interactive projector solution can be created using the optional NP03Wi interactive system (dual pens) with auto calibration. With its ability to be mounted to the wall directly above the screen on which it projects, this model helps eliminate the shadows and glare typically found with standard projection systems. The UM361Xgi includes a powerful 20W speaker, closed captioning and RJ-45 for remote management over a network, and its input panel includes dual HDMI, VGA and a microphone input to amplify the presenter’s voice. Using a commercially available USB cable (compatible with USB 2.0 specifications) to connect the computer with the UMp361xgi rojector allows you to send your computer screen image and sound to the projector without the need of traditional computer cables. The UM361xgi rojector also has a viewer function that lets you project images (JPEG) stored on USB memory, so you can give presentations without a computer. Lamps can blow, if you need your projector working and can't afford down time, you may need to keep a spare lamp. The replacement projector lamp for the NEC UM361xgi is the NP32LP.